Alberta author Fred Stenson’s unsettling, cautionary new novel takes its title from “Unetaneh Tokef,” a Jewish liturgical poem associated with the Day of Atonement. Referenced in a Leonard Cohen song that shares a title with Stenson’s novel, the verse enumerates the various ways humans are fated to perish – by fire, water, plague, stoning, and so on. 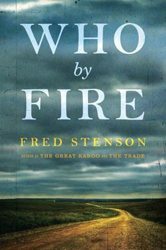 Pivoting between the past and the present, Who by Fire charts the struggles encountered by the Ryder family beginning in 1961, when their southern Alberta farm becomes neighbour to a sour gas processing plant. It isn’t long before the Ryder patriarch, Tom, is convinced that highly toxic hydrogen sulfide gas wafting downwind is killing his livestock and imperiling the health of his wife, Ella, and three children, Jeannie, Donna, and Billy. Complicating matters is Ella’s apparent indifference to Tom’s crusade against the plant, coupled with her simmering attraction to the plant’s only principled employee, Lance Evert. Flash forward and Billy, mentored by Evert, is a Fort McMurray petroleum industry engineer afflicted by both an addiction to gambling and environmental scruples that prevent him from reliably toeing the company line. “Unetaneh Tokef” is rooted in the notion that our fates are predetermined. Who by Fire tells the story of a society irrevocably altered by change. The novel’s strength is in the unsentimental way it depicts how poorly equipped the Ryders are to struggle against these pernicious influences or even to fully comprehend their impact. The story is too solidly rooted in character to be dismissed as a polemic dressed up as fiction. This is not Hollywood’s Erin Brockovich transplanted to the oil sands, but an intimately framed tale of classically tragic dimensions in which individuals are ensnared by larger forces – albeit of human, rather than divine, design.